Not all wedding rings have to be plain, precious metal bands, and pictures of unique alternative wedding rings show the wide range of beautiful and unusual designs that can be just as romantic and sentimental as any wedding rings. Click on the 'buy now' link at the bottom of each image to get information on how to purchase the item. A titanium band with a braided rope, for example, is distinctive and stunning without being predictable. Wedding rings made from unique materials such as jade are distinctive and beautiful. Other options include turquoise, quartz, or hematite, any of which is a stunning option and far more unusual than metal bands. Add a similarly colored gemstone for an extravagant look. While a wedding ring symbolizes a couple's commitment to one another, it can also symbolize an individual's passions as a figural fashion ring. Dolphins are popular choices, while western wedding rings can symbolize a love of horses, and there are many other variations besides. Carved rings have unique textures and designs that plain bands lack. Herringbone designs are popular to carve into thick rings, while other patterns include braids, Celtic knots, and waves. As a married couple, each individual holds the key to the other's heart, and a heart and key wedding ring set can symbolize that. Some sets include both symbols on a single ring, while others are split sets that allow one person to wear the heart while another wears the matching key. Highly polished wood wedding rings are a unique alternative to traditional bands, and they are an environmentally friendly choice that is becoming more and more popular. The grain of the wood is very beautiful, or the ring may be set with diamonds or gemstones for added sparkle. Diamond ring guards and wraps are popular choices for wedding rings because they highlight the engagement ring while adding even more beauty to the set. Unique wraps can have a mixture of strong angles, different types of settings or even different gemstones rather than diamonds, all of which serves to make your ring stand out more. Wedding bands can be inlaid with a wide range of materials. Contrasting, braided metals opal bands or turquoise inlay designs are distinctive choices. A wave pattern on a unique alternative wedding band represents the continuity of love paired with the boundless depths and strength of the ocean. This is a perfect choice for any couple who loves the ocean. A simple band design may not be unique, but choosing an unusual precious metal for the ring makes it more distinctive. Pink or rose gold is a beautiful and romantic choice, particularly for women's wedding rings. Other unique metals include tungsten, stainless steel, and titanium. A smooth, plain band may be classic and beautiful, but a textured wedding band is a more unique option. Paired with different colored metals and inlaid patterns, these touches create a truly unique alternative to most wedding rings. Diamonds are popular in wedding rings, but instead of channel set diaonds or a pave diamond wedding ring, choose more unique diamond shapes and patterns to create a custom wedding ring in an elegant style. 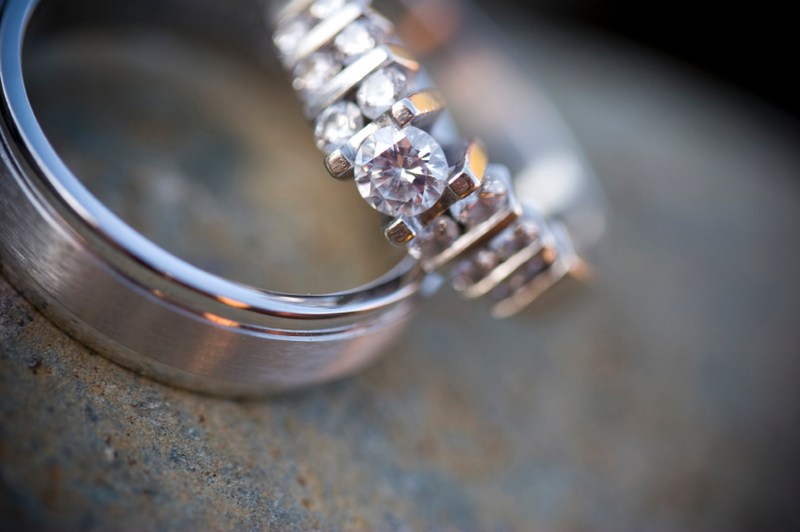 For some couples, this type of ring may be both the engagement ring and the wedding band because it is to unique and beautiful that a second ring is unnecessary. A wedding ring doesn't need to fit on the finger. Belly rings are a fun and unique choice for some couples while others may enjoy toe rings or tattooed wedding rings.